On stage at Richards on Richards in Vancouver, Angus and Julia Stone seem to have jumped out of the past, two travelling minstrels sharing their soft, folk music. Music that is even more powerful live than it is on a recording. As they play, this brother sister duo from Australia often share a look. A look that implies they’re enjoying this as much as the audience. They’re not just putting on a show; they’re sharing their music with us. Letting us in on their little secret. 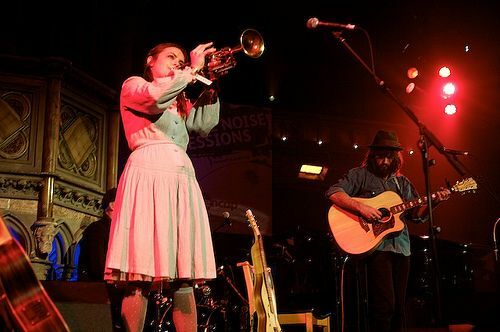 Despite a repertoire of slower songs, their rhythms and melodies and the occasional trumpet solo succeed in getting the crowd moving, with Julia leading the way. In her vintage long white dress with flowers in her hair she is dancing on stage, subtly encouraging the crowd to do the same. Julia has a voice that is as unique as her style and fluctuates dramatically to use her entire vocal range while she sings, from the softer Wasted to more intense vocals on Private Lawns. Angus also sings and together they have created a sound that is soft and peaceful, and complimented by charming lyrics sung by two distinctive voices that are perfectly suited to the songs they sing. As the opening band they played a short set, and it did not end without cries for an encore. Unfortunately the audience did not get their wish but they still went home happy. If the true beauty of a song is its ability to evoke a feeling in the listener, then Angus and Julia Stone are performing incredibly beautiful music - never before have I been more inspired to learn how to play the harmonica. Life is good, but there is too much of a good thing.